The influx of mangoes is expected to continue throughout the festive season with consumers ready to buy up this season’s bummer crop. 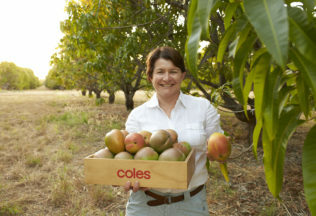 One of Australia’s largest producers of Kengiston pride and R2E2 mangoes, Manbulloo Mangoes, says it is expecting to supply Coles more than seven million mangoes by season end. Coles General Manager Fresh Produce, Brad Gorman, said demand is growing for the fruit. “Mangoes are one of the most popular summer fruits featuring on many Christmas tables around the country, so we’re thrilled to have more Aussie mangoes from Manbulloo for our customers to enjoy,” said Gorman. “Manbulloo has been supplying Coles stunning quality mangoes for more than 10 years Mangoes. The Coles Nurture Fund was established in April 2015 with Coles announcing it would provide AUD $50 million in grants over five years to businesses in the food and grocery sector to promote investment in innovation.